Biggar Rugby Club girls produced a magnificent performance to successfully defend the Under-15 Club Cup final at Murrayfield. 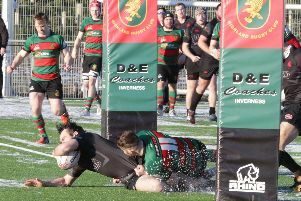 Biggar won 27-20 against a Stirling County XV who refused to give up and staged a dramatic fightback on Saturday to make the last 10 minutes a tense, knife-edged affair. But Biggar held on to win, making it their third success in the competition in recent years having also triumphed in 2011 and 2016. The Hartreemill team had earlier opened up strongly but it was Stirling who took an early lead to go 5-0 ahead. However, Emelia Knights soon scored a try for Biggar and Katie McPherson added the conversion for 7-5 to the Clydesdale side. Biggar then hit a purple patch and added tries from Emma Orr and then a brace from Geraldine Kimm to take the game by the scruff of the neck to 20-5 with some 23 minutes on the clock. Another Biggar score at this point might have signalled a collpase to Stirling’s challenge in the match but instead, undaunted and unphased, Stirling hit back almost immediately to stay in touch. A third Stirling try minutes later then made it even closer at 22-15. And this could so easily have been 22-17 as the conversion attempt bounced back off the crossbar. At half-time the score was 22-15 and the match remained finely balanced. A pulsating opening spell after the break saw both teams go really close but neither team could get across the try line. It was Stirling who eventually broke the deadlock with another cracking try - their fourth. There were now just two points in it at 22-20, Stirling’s well-struck conversion dropping just beneath the bar. Having weathered the storm and Stirling’s comeback it was now down to Biggar to regroup and press home. There were many anxious moments for both sets of supporters but a lung-bursting run from halfway by Biggar’s Rachel Phillips took her clear and over the line for the decisive score. There was very little time remaining and to the relief of the Biggar support at least, referee Alexandra Haskett blew for full time - cue the celebrations! Biggar’s latest success in the National Cup was richly deserved and celebrated royally by everyone in the playing squad as well as coaches Eric Shearer, Mark Foster and Nathan Knights. See www.carlukegazette.co.uk for more recation to Biggar’s superb victory as well as more match action phtographic shots kindly supplied by Nigel Pacey.